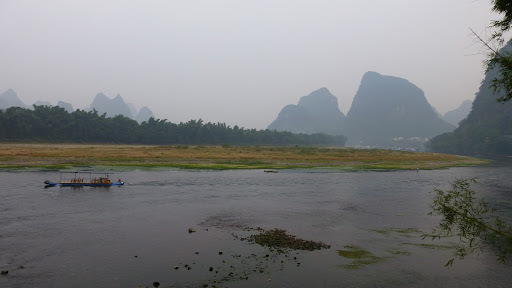 Yangshuo, beer and fish, great combo. I decided many years ago that because I love food and I love eating, I’d better learn to cook if I want to eat well. So for some time I’ve been developing my hobby of recreating dishes and finding ways to produce meals that I’ve enjoyed in restaurants or found in recipe books and food magazines. 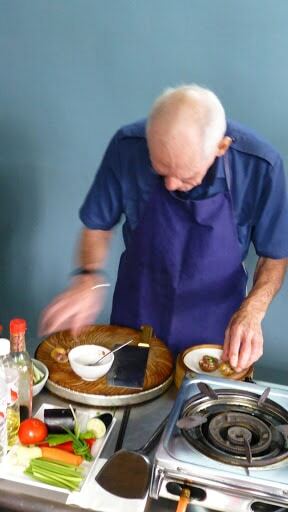 What a great bonus then that a cooking class in Yangshuo was an included activity in our Intrepid trip. 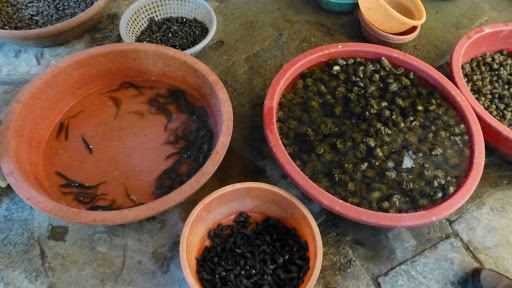 A few days later in Chengdu we had another opportunity for a cooking class, which I’ll carry on about in a future post. Note the washing hanging at the back of the market. 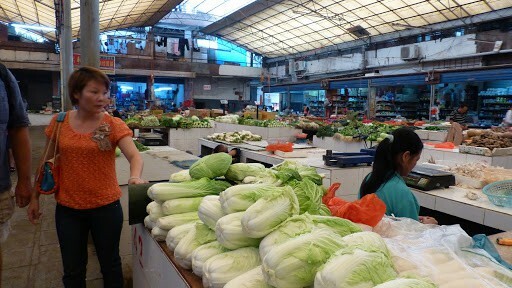 Jennifer was our teacher for the day and she took us to the colourful local wet market and guided us through the rows of strange-shaped vegetables and fruits, many of which I’d never seen before. 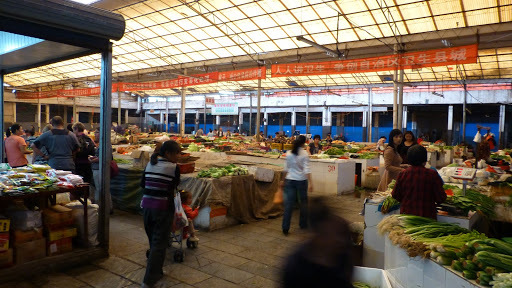 This place was alive with activity and there were rows and rows of stalls lined up with produce. We moved around fascinated, peering at the live frogs (looked like cane toads), eels, snails and other unexplainable beings. How about these beauties. Reminds me of summer in Queensland. 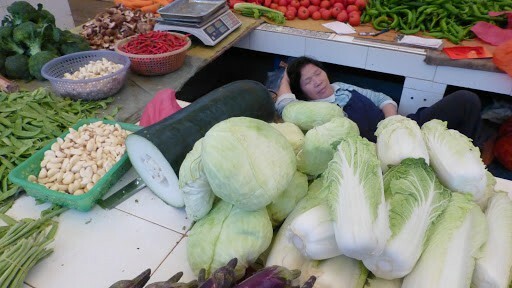 Hard work running a market stall. 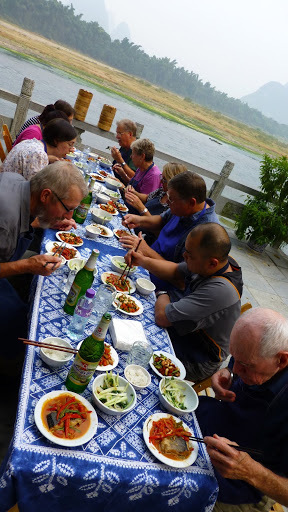 After the market visit we all piled into mini vans and were taken to the Yangshuo Cooking School a few kilometers away, and we were shown to a lovely garden courtyard overlooking the beautiful flowing Li River. 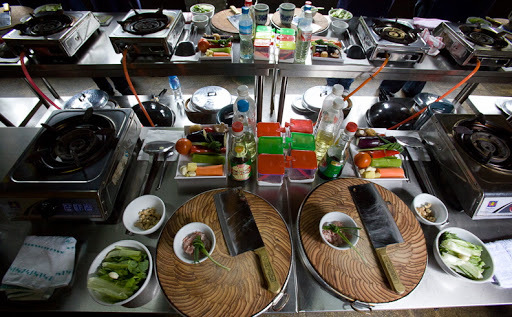 Once in the adjacent kitchen we each donned our aprons and found the kitchen set up with our own gas cooker, a wok, a cleaver, various condiments, plus a beautiful steel-rimmed bamboo chopping board. I’ll have to go looking for one at home because they were too heavy to buy in China and carry around to bring home. The class started with Jennifer demonstrating the slicing and chopping methods used to prepare the ingredients for the dishes. Jennifer showed the preparation of each dish individually and then it’s over to us to fire up our wok and replicate the dish (with a bit of help if we needed). It was pretty fast paced and mostly we got it right. But we had to be very quick, and working with high heat really got us going and we tried not to splash boiling hot oil over each other. It was great fun and you could feel the tension in the room as we all worked intensely on our own creations. Finally we finished cooking our dishes then we all sat at the long table with ice cold beers (or Sprite for non-imbibers) in the courtyard and enjoyed the culinary delights from our hard work, while marveling at our incredible talents. Tucking in to our delicious feast. Great concentration. How beautiful is that view! One thing I learned about China (as in Europe) is that they stay true to regional and seasonal food, and one local gem we learned about was Beer Fish. 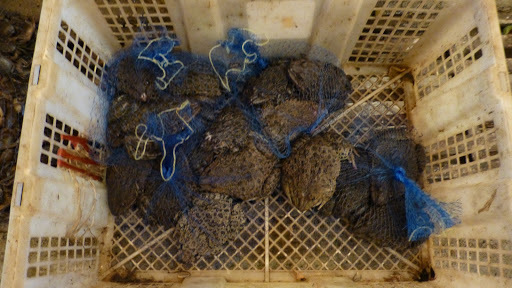 We think it would work really well with snapper or other local Qld sea fish. Anyway, here’s the recipe. I’m going to make it at home. Let me know if you’d like to come over and try it. 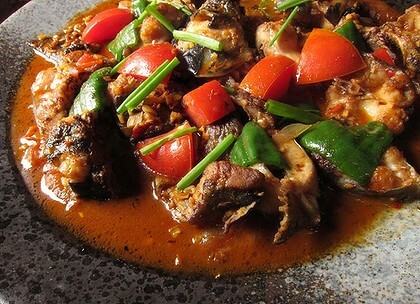 Braised in a brew made from the spring waters that flow into the legendary Li River, Beer Fish has become Yangshuo’s most famous dish. Heat wok. Add oil and heat. Put fish into wok skin side down, put salt on top of fish and fry on each side for about 3 minutes or until skin is brown. Put the vegetable, garlic and ginger on top of the fish. Pour on soy sauce and beer. Cover and cook for 5 minutes. Remove lid to reduce liquid for another 2 minutes. Serve.